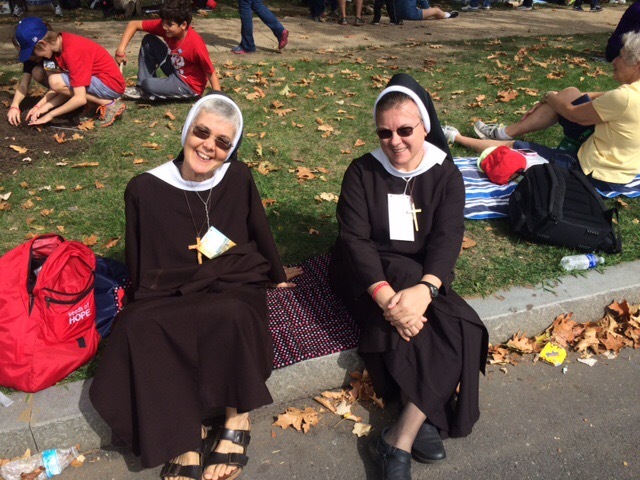 On Saturday, September 26, we were blest to gather with thousands of families, religious sisters, brothers, and priests from 150 countries around the world. 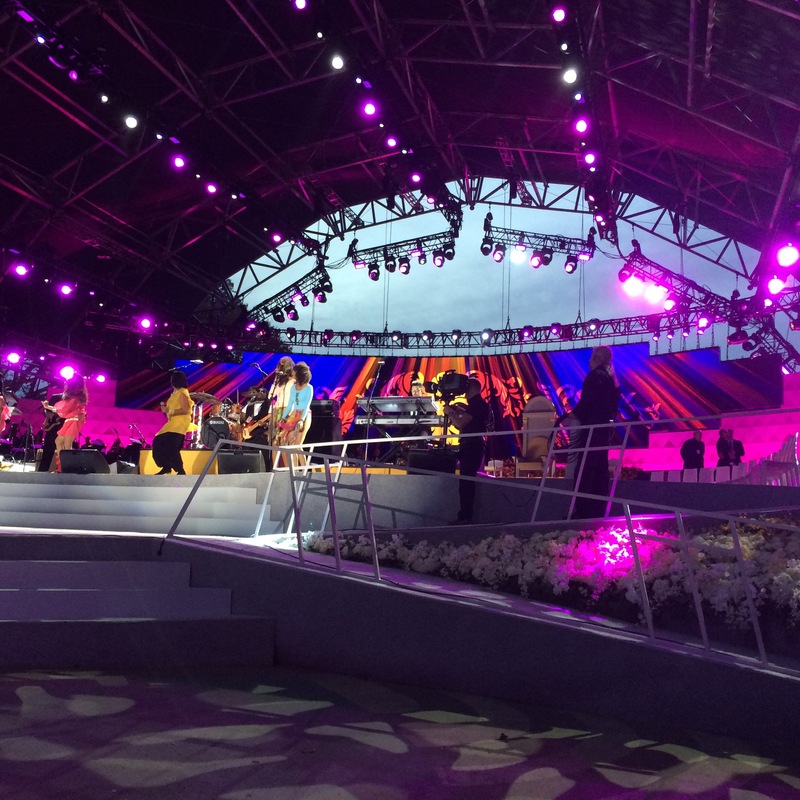 It was a spectacular experience of encounter–truly God in our midst. We even saw our Haitian flag! We were sitting on the curb, watching the big screen nearest us. Then we met our Sister Eliana. She shared with us that a young priest in her group was on the other side listening to confessions. We thought this was a great idea. 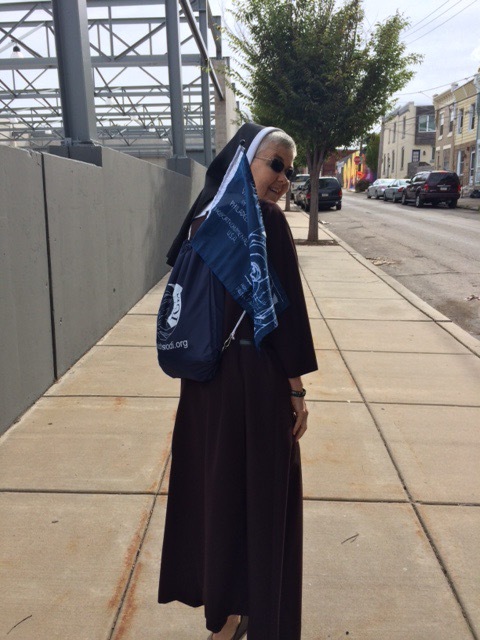 We had just met a priest from Columbia and one from Kansas so we got on a mission of mercy. We asked them if they would listen to confessions on the street. 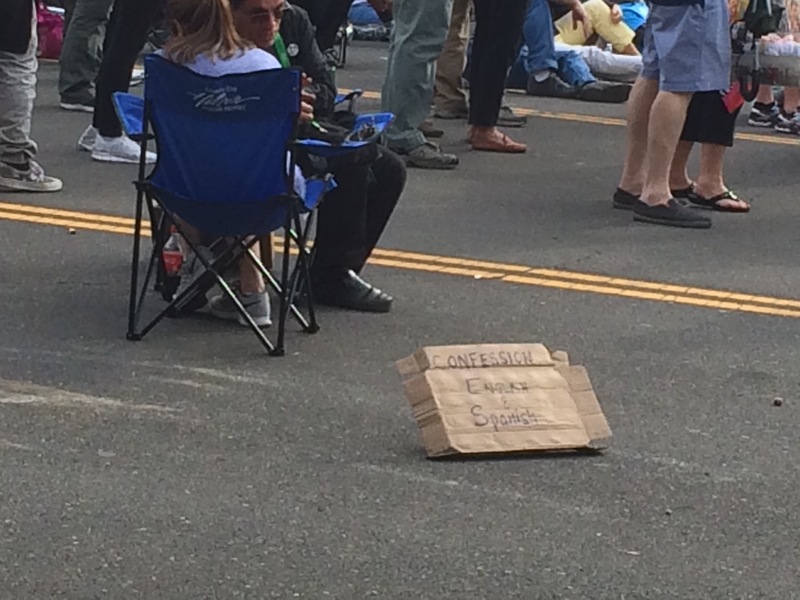 We looked for chairs for them, asking people if we could borrow their chairs. Then the lines formed. It was unbelievable! 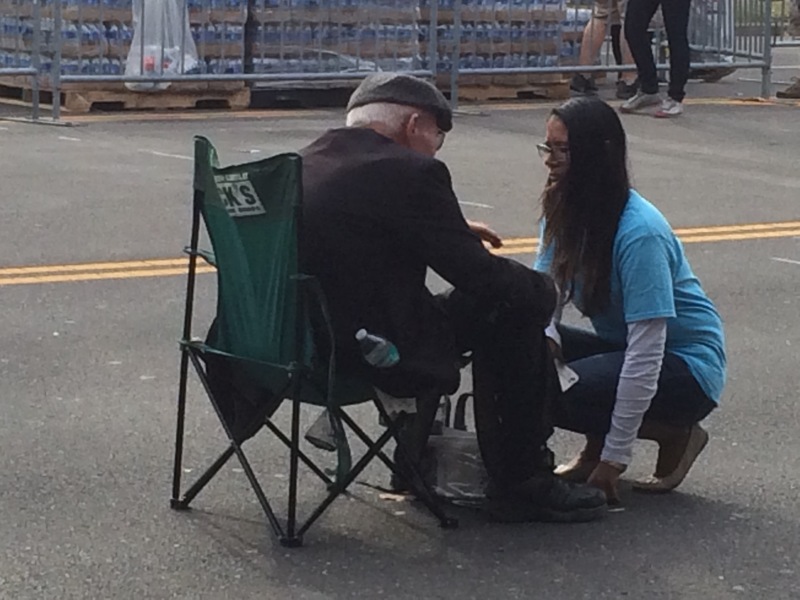 At about 4:00 p.m., we received a message from Mary, a woman we had met early that morning while standing on the street waiting for Pope Francis. She had two tickets for inside, with seats! We were in shock to hear this. And where was she standing? Under the Haitian flag! We went inside, filled with awe that the Lord had led us all day to this moment. Our tickets were in different sections. But you know us, we decided to walk around to see the stage and the people. 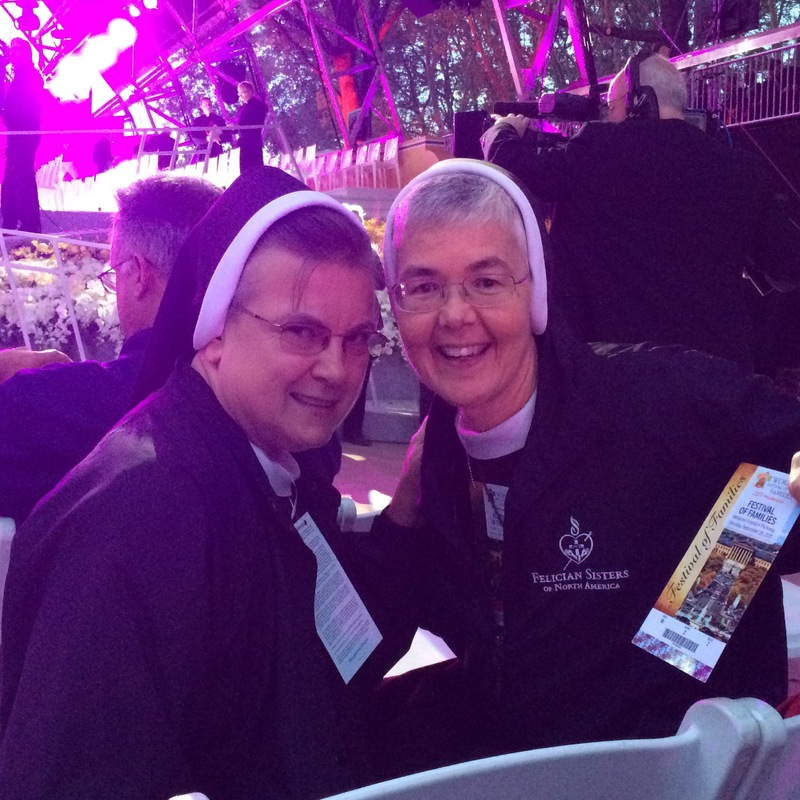 After we finished roaming, we sat down in the section where Sr. Inga was to be; and we prayed our Evening Prayer. As soon as we finished, a gentleman in a suit and a Liberty Bell pin sat down next to us. He asked us where we were from and, of course, we said Jacmel, Haiti. He then said I have something special for you. I have two tickets for you in the second row in front of the Pope!!! We were in awe and unbelief! We asked his name; it was John. He was one of the head committee members of The World Meeting of Families. This happened right before everything started. We went to our seats, and they were right in front of the Holy Father’s chair! 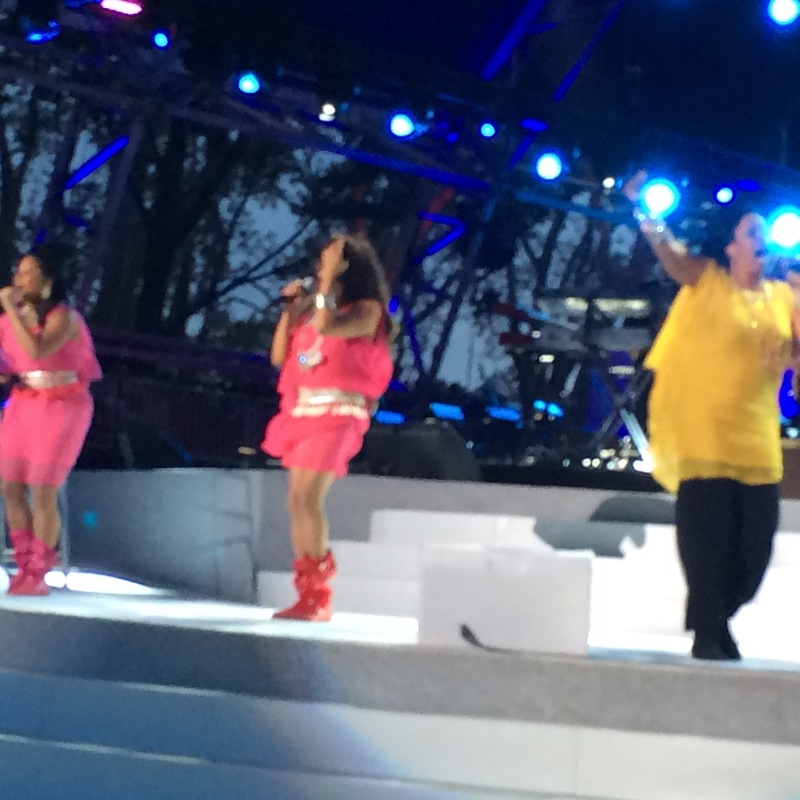 Then Sister Sledge came out and started to sing “We are Family.” We started to dance in our seats. We thought about all our Felician Sisters throughout the world, all families, friends, benefactors–everyone who accompanies us in the Haiti mission! 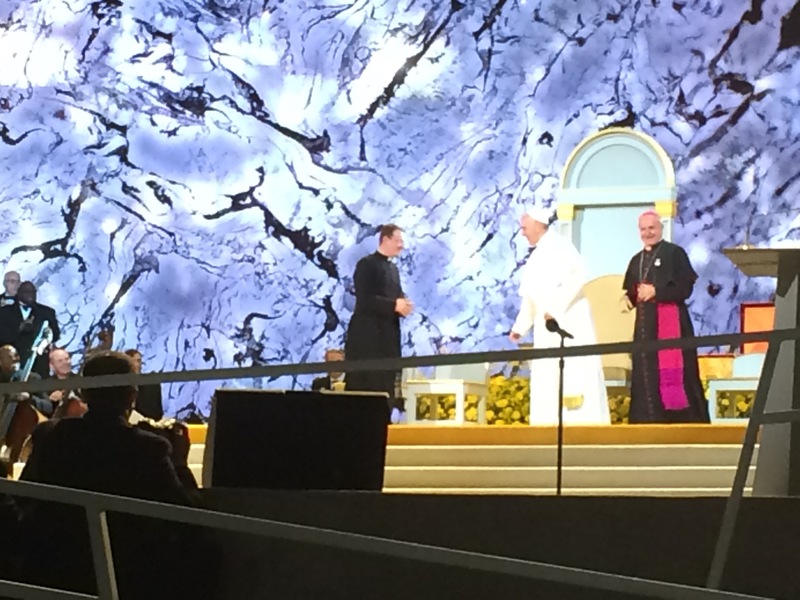 When the Holy Father arrived, there was a bolt of the Holy Spirit that filled the place. It felt like Pentecost. The families that gave witness were moving and inspiring. 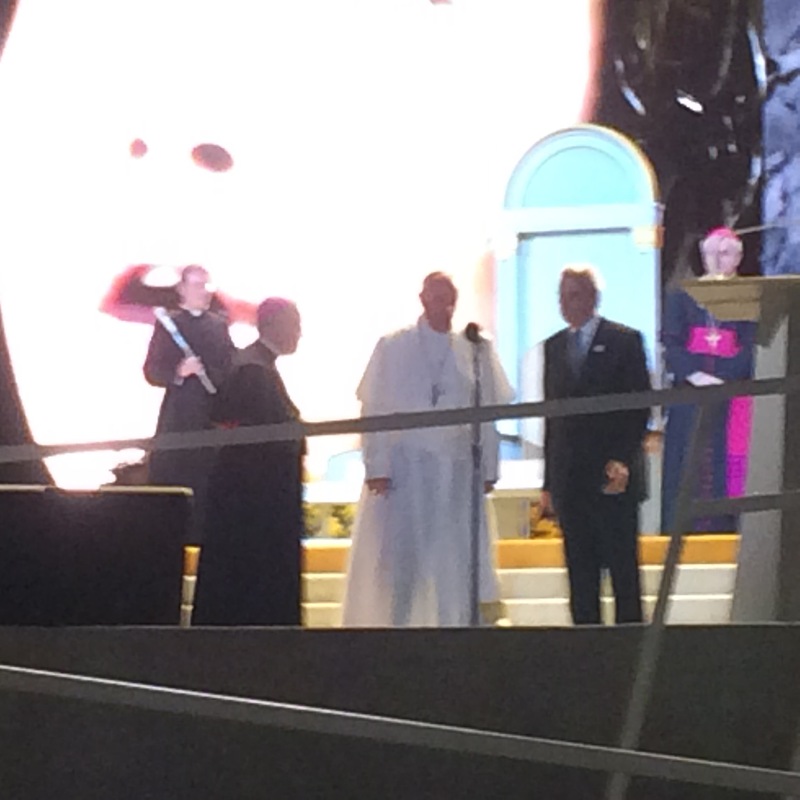 Then Pope Francis came to the podium, right before us. We were literally sitting at his feet. He spoke from the depths of his heart, about the gift and blessing of the family and the call to love and forgive. We felt as though he was looking at us. 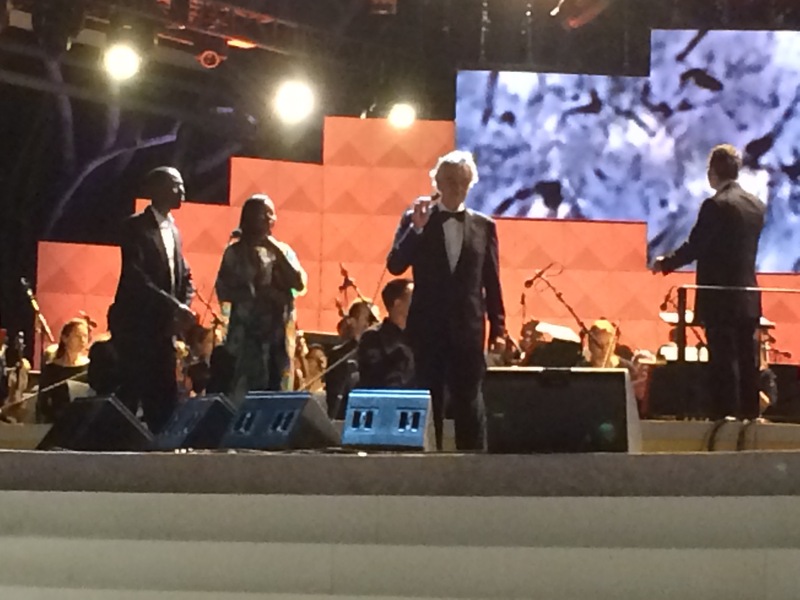 After he spoke, Andre Boccelli came out and sang the Our Father, the most moving experience of unity in the moment. 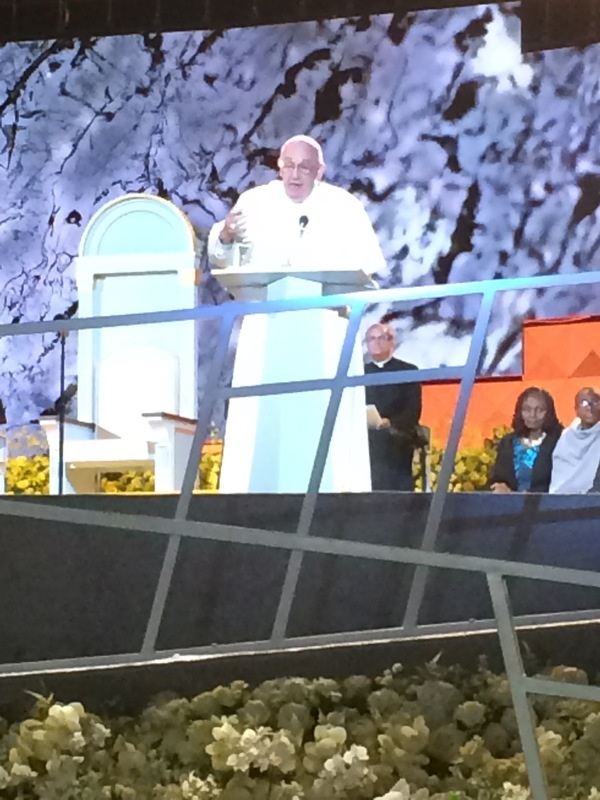 As Pope Francis gave us the final blessing, every one of you were in our hearts. May God continue to be known, loved and glorified! 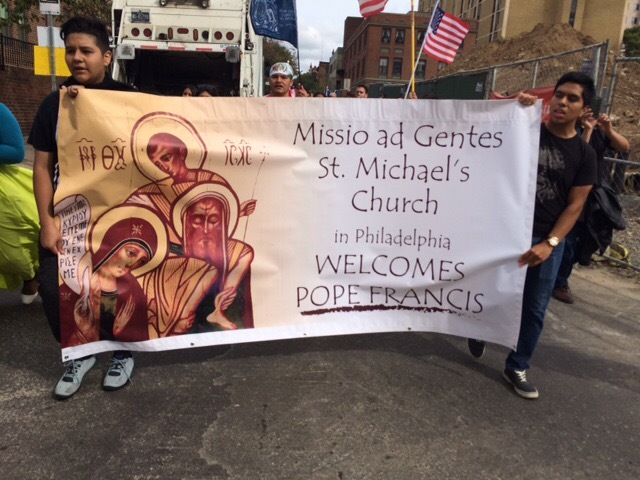 We believed that, coming to the U.S. at this time, we would get an opportunity to see Pope Francis. 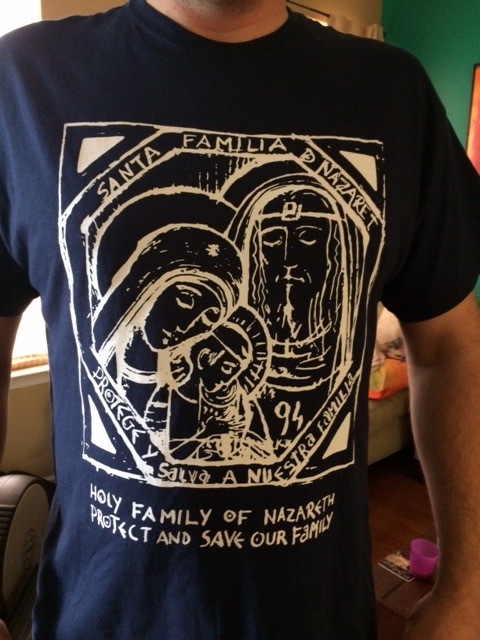 Jesus says: “Have faith.” So we put our names in the USCCB lottery and waited, but we did not win. Then we thought maybe in NYC we would get a chance, but it was too late. “O you of little faith…” God certainly had another plan for us. On Friday. 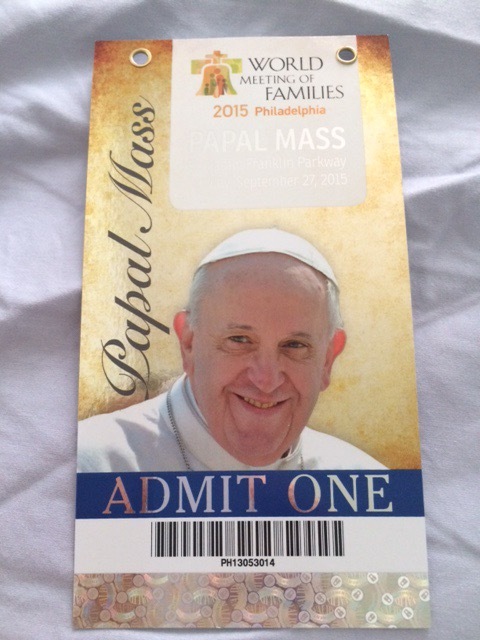 Sr. Joselle, local minister in Lodi, said her sister had two tickets for the Mass in Philadelphia. We would need to find a place to stay. But it was last minute, and all places were full. Once again, “O you of little faith.” God never disappoints us. 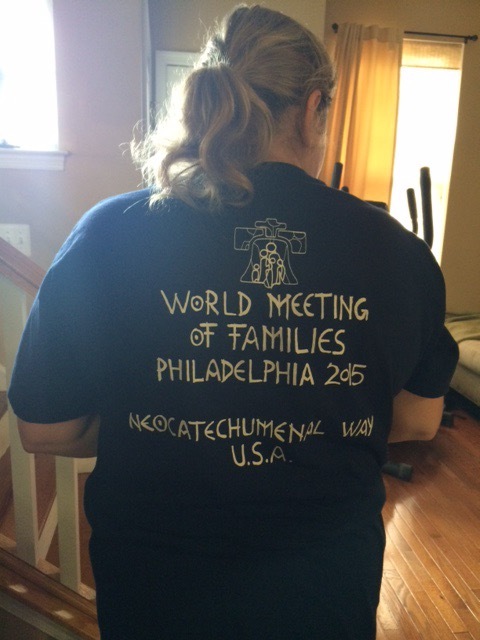 Our brothers and sisters who we met last weekend in Chicago from the Neocatechumenal Way opened their heart and home. 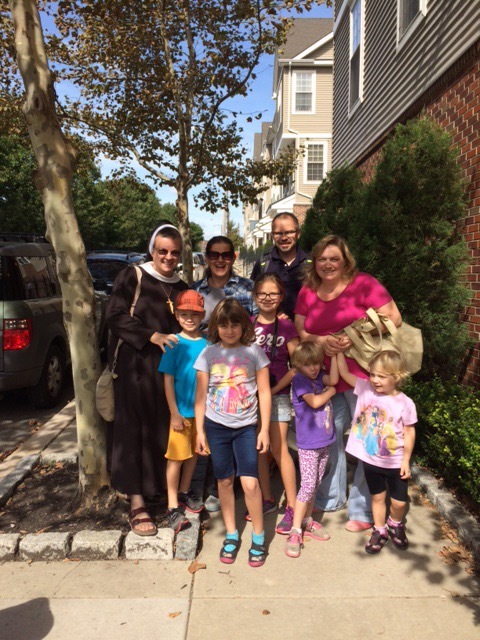 We had a place to stay just a 45-minute walk from where the Mass would take place! We are staying with two families and a group of little kids! We seem to always be surrounded by kids. Praise the Lord for them and for the family! 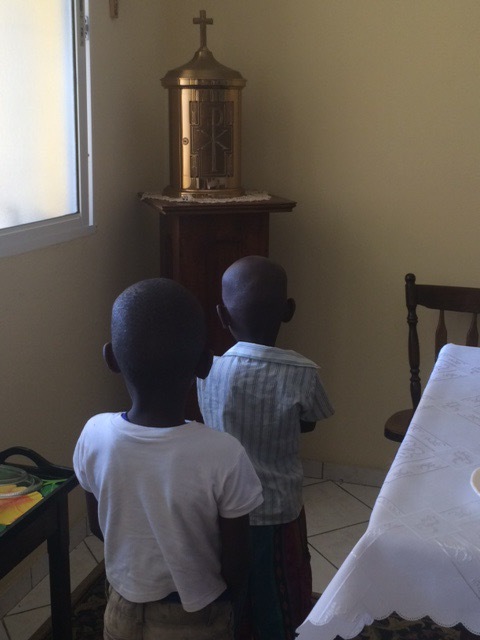 Last Sunday morning, while we were at prayer, two little boys came to our door. We told them that Sunday is our day of prayer, and we have no activities. They wanted to come in and pray with us. We welcomed them into the chapel and began to tell them about Jesus and how much we love Him, how He loves them, and how we see Him in them. After, we asked them to ask Jesus for what they needed and/or wanted from Jesus, because Jesus loves them so much. They went up by the tabernacle and stood so reverently before Jesus for a few moments. To watch them was a real meditation of humility and reverence. After those few moments, we asked them what they asked Jesus. Jim had asked Jesus for a backpack, notebooks and pencils. Donaldson asked Jesus for a peanut and jelly sandwich because he was hungry. I wonder what the kids in the U.S. pray for? Since last year, Ann extended her love for the missions to us. 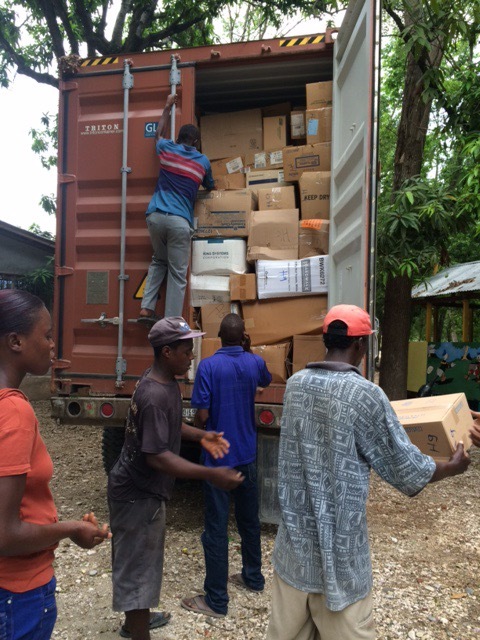 This is the second container she has sent to Jacmel. 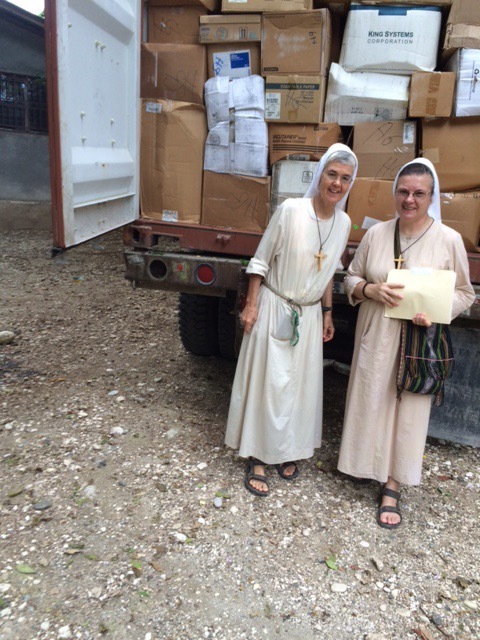 This time, the contents in the container were intended for our new seminary in the Diocese of Jacmel and the local hospital that serves the poor. 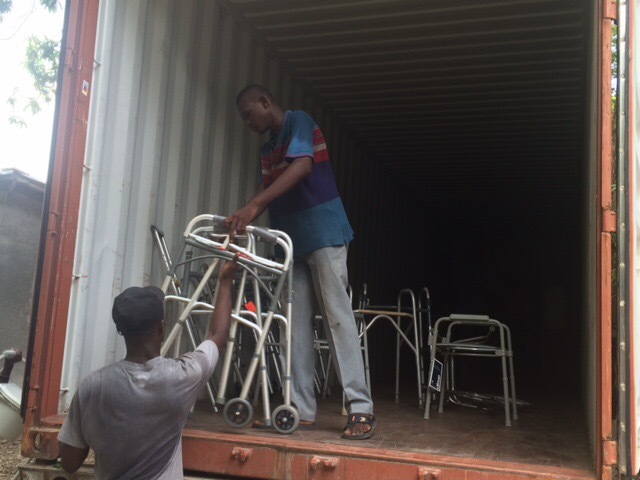 We would like to give you a little background about what happens when a container is sent to Haiti. It gets packed up in New York. 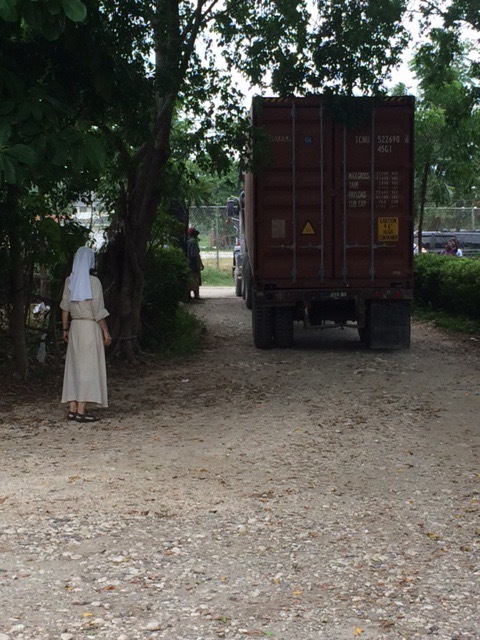 Ann puts in her donations, then items are added from our Sisters in North America. 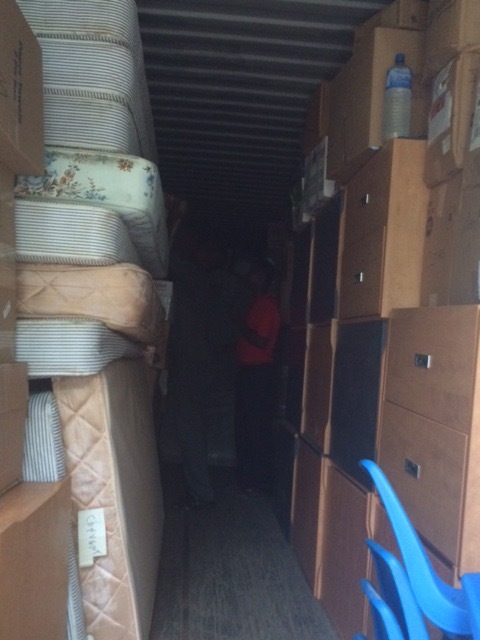 The container was sent on August 3, and it arrived in Port au Prince on August 22. That is when we enter a race to get it out of Port as quickly as possible because, after ten days, we have to pay a fine for each day it sits there. We cannot do all that needs to be done on our own. We need to hire a broker who goes to the different Ministries to get it out for us; she does all the paperwork. 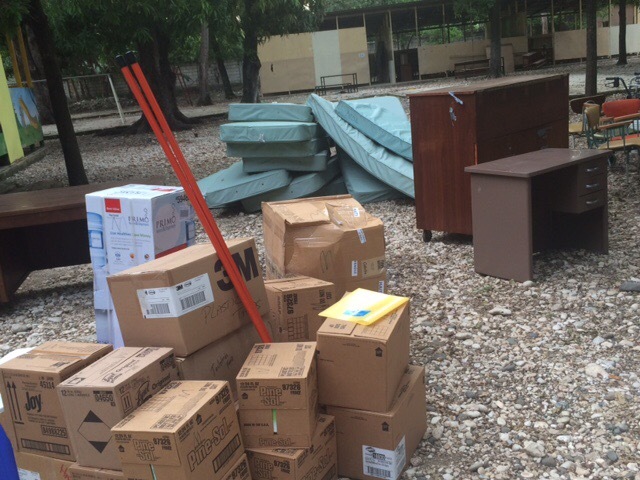 Because this was coming to the Diocese of Jacmel, we had to have a letter from the Bishop so we would not be taxed. This takes a lot of time and needs a lot of patience. 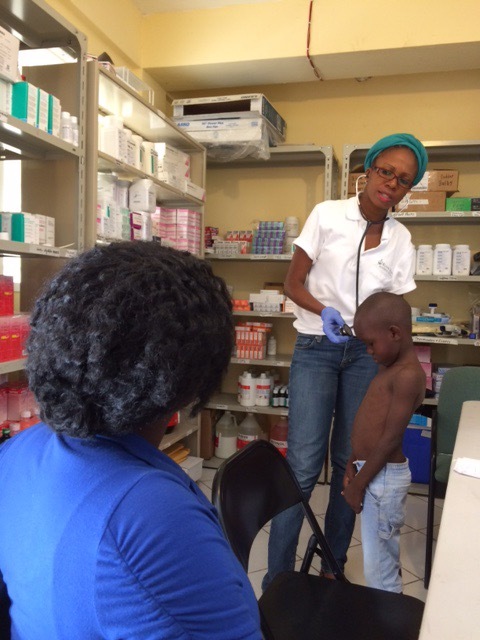 There are fees that must be paid ahead of time, and checks must sent from Jacmel to Port au Prince. We are blest to have Nicole as our broker. She is very good at her job and very dependable. This past Thursday, we were told that the container could be released. 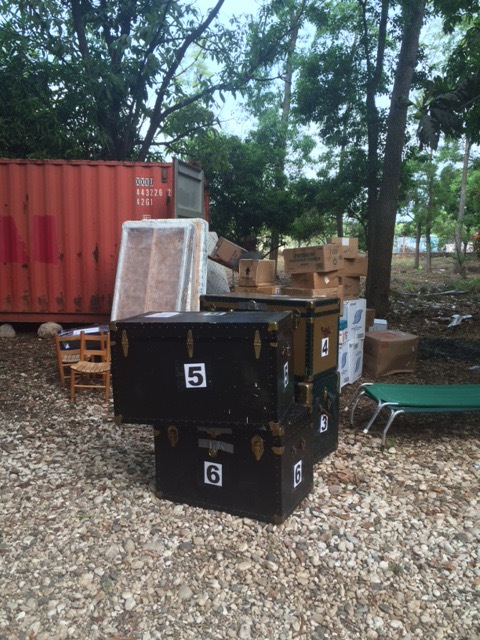 We went to Port au Prince to pay for the container and to arrange to have it trucked to Jacmel. We were told that it was leaving Thursday afternoon and would arrive in the evening. Well, evening came, and morning followed, the second day and no container. 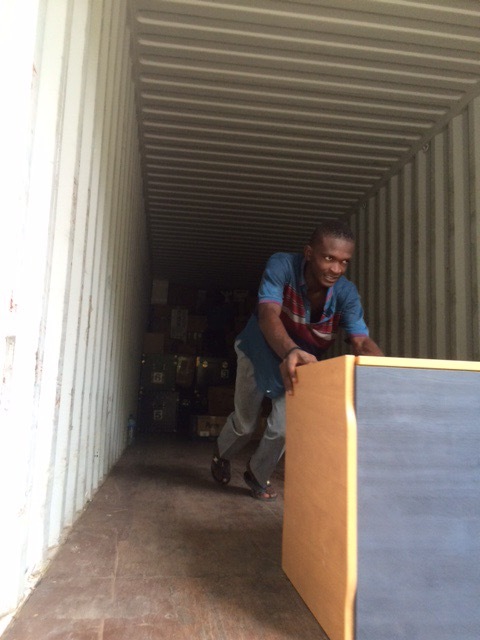 We again called the man who was settling about the container being shipped to Jacmel. He made some calls and then told us it was in Carrfour, a town outside of Port au Prince. Then we were told we could not open the container when it would arrive until an inspector would come. In the meantime, we had lined up some of our boys and some other friends to help with the unloading. Also Caritas provided their trucks. This meant having water and food for our helpers. When we heard we could not open it when it arrived, we wondered how are we going to be able to do this and have our help waiting, possibly for days. So we went to Fr. Bertrande, the Director of Caritas, asking him to call the inspector and explain what the container was for and what was inside. He said we had the permission to open it when it arrived. So we waited and waited again. Evening came and morning followed the third day. There was still no container. So again, we called the man contacting the trucking company. Finally they called us and informed us we needed to pay an extra fine in the port for not picking up the container on Thursday. We still do not know why it was not picked up. So, we paid the extra $90. The container was on its way by 11 a.m. Saturday morning. Again, we waited…Then, at 4 p.m., the container finally arrived, and everything went smoothly because we could finally control the unpacking. With the help of Caritas taking the things for the new seminary and for the hospital, and with our boys and Fritz, we finished in 3 hours. 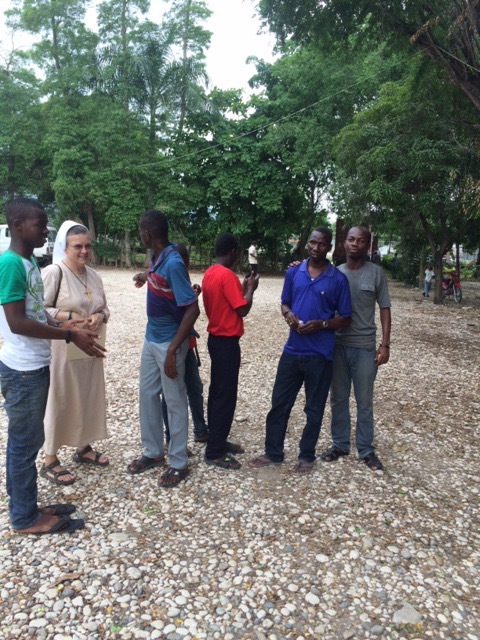 We thank God for Ann Zon and all those who donated to the poor here in Haiti. May God bless you all! The blessing of having our own doctor! 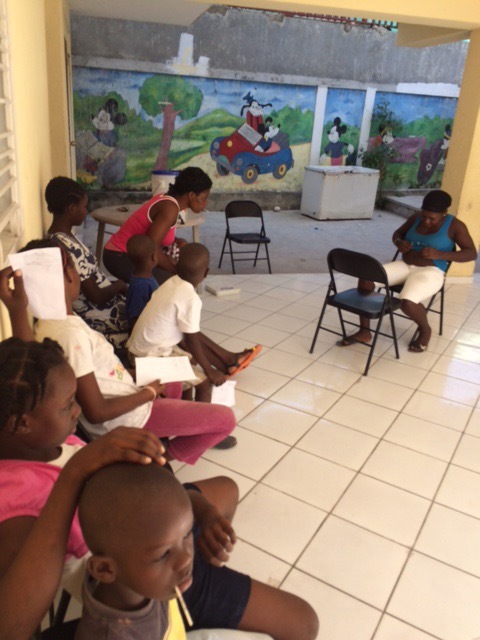 On Tuesday, September 1, our Dr. Wanitha spent the morning seeing the kids from our neighborhood whom we suspected have scabbies. This is a skin disease that is found among the poor due to poor sanitary conditions. It is highly contagious and easily spread among family members. 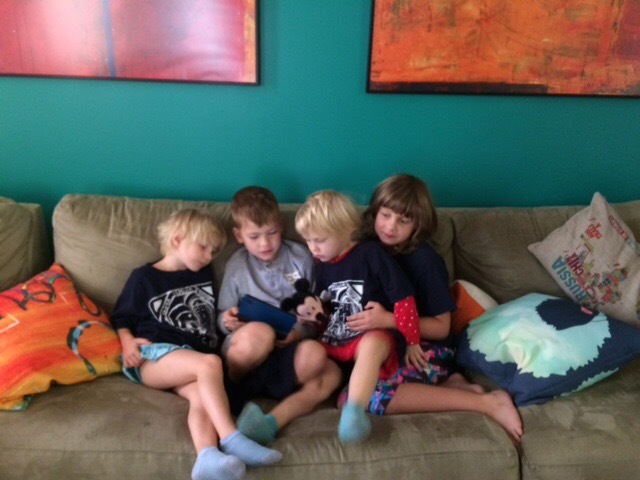 We had two families come for consultation, and our suspicions were correct. All were given needed medication for the disease. They need to wash all their clothes and clean their living space well. We want to provide the needed materials to clean and wash, using sanitizers. Our people do not have access to free running water so this becomes a problem. We also have been providing them with water so they have the opportunity to bathe twice a day, and they have been given the needed medical treatments. Both families do participate in the “Water with Blessing” project so they do have clean water available to them. 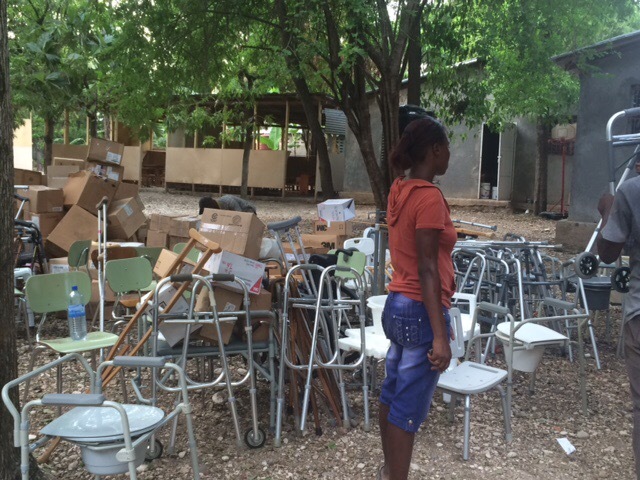 Again, we thank you for your generous support for this to be possible and for our people to get the care they need.